Ride the elevator all the way to the top of the Sheila C. Johnson Design Center (SJDC) for a view of the future of education at Parsons School of Design. There, the elevator doors open to a sprawling space accented with hardwood floors, furnished with long workbenches and stools, and immersed in natural light. The western half of the floor boasts floor-to-ceiling windows that open to inspiring views of Manhattan. This is the new hub for Parsons’ School of Constructed Environments (SCE). Comprising 8,900 square feet, the floor, which features new studios for students and administrative spaces for SCE leadership, is both the new home of the school and the latest phase in a long-term plan to reorganize and upgrade all of Parsons’ facilities to meet the demands of its integrated and interdisciplinary curricula. Over the next few years, all of Parsons’ schools — the School of Fashion; School of Art, Media, and Technology; School of Design Strategies; and School of Art and Design History and Theory — will move into their own hubs, separated by short elevator rides from each other, and the Making Center, in the SJDC. SCE is the first Parsons school to move into its new digs. Designed by Rice + Lipka Architects, the Manhattan-based firm behind the Making Center, the SCE Hub is in many ways an extension of The New School’s new state-of-the-art studio space. Like the Making Center, which is situated on the lower level and the second and third floors of SJDC, the SCE Hub features an open floor plan that is “designed to enhance collaborative opportunities and serendipitous exchanges,” says Robert Kirkbride, dean of SCE. The proximity of the SCE Hub to the Making Center will offer students easy access to cutting-edge tools and resources. This summer, participants in SCE’s Design Workshop will use the space — accessible by a freight elevator in the north studio of the SCE Hub — for full-scale prototyping of components for the design upgrade of the foyer at the Children’s Museum of the Arts. The western half of the floor is made up of spacious north- and south-facing studios, which flank the centrally located Sky Room, where students can come together to review and present their work and attend lectures and classes. Offices for SCE faculty and staff are located on the eastern end of the floor. From a shared kitchenette between the studio and administrative zones of the hub, individuals using the space can see the Empire State Building, the World Trade Center, Parsons SCE East building, and the East River. SCE students are floored by the new space, which will provide new workspaces and enhanced opportunities to collaborate with their peers from across Parsons schools. The creation of the Parsons hubs grew out of a master facilities plan. Completed with the help of award-winning architecture office Marble Fairbanks, it identified the best use for more than 200,000 square feet of academic space dedicated to Parsons’ studios, shops, classrooms, and offices, as well as the Making Center. 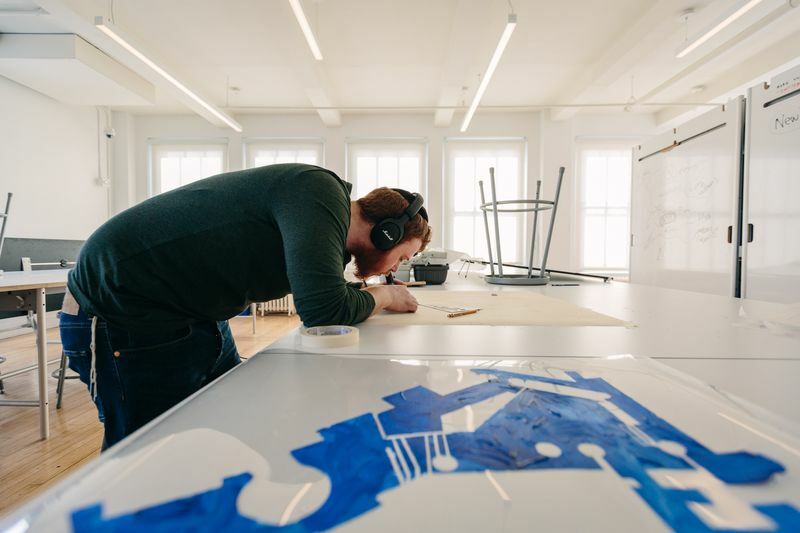 In 2015, Parsons launched a fundraising campaign to support the master facilities plan as well as other initiatives such as endowed professorships and scholarships, the Parsons Scholars program, and research. To date, Parsons has raised more than $29 million to support these activities, including a gift from Kay Unger Family Foundation toward the Making Center. The next hub being created, also to be designed by Rice+Lipka, is for the School of Art, Media, and Technology.